As we head into February, we’re taking a look back at January — Glaucoma awareness month. If detected early, glaucoma can usually be controlled and severe vision loss can often be prevented. Vision that is lost from glaucoma can’t be restored. This makes early treatment vital as currently, there is no cure. According to CDC, African Americans are 6 to 8 times more likely to get glaucoma than white people. People with diabetes are 2x more likely to develop glaucoma than people without diabetes. There are two types of Glaucoma, the first is open-angle and the second is narrow angle. Open angle glaucoma tends to happen gradually. When you have this form of glaucoma, it means that your eye is not draining fluid the way it should be and because of this, the eye pressure begins to rise, damaging the optic nerve. Although there is damage, there is no pain and there are no vision changes in the first instance. 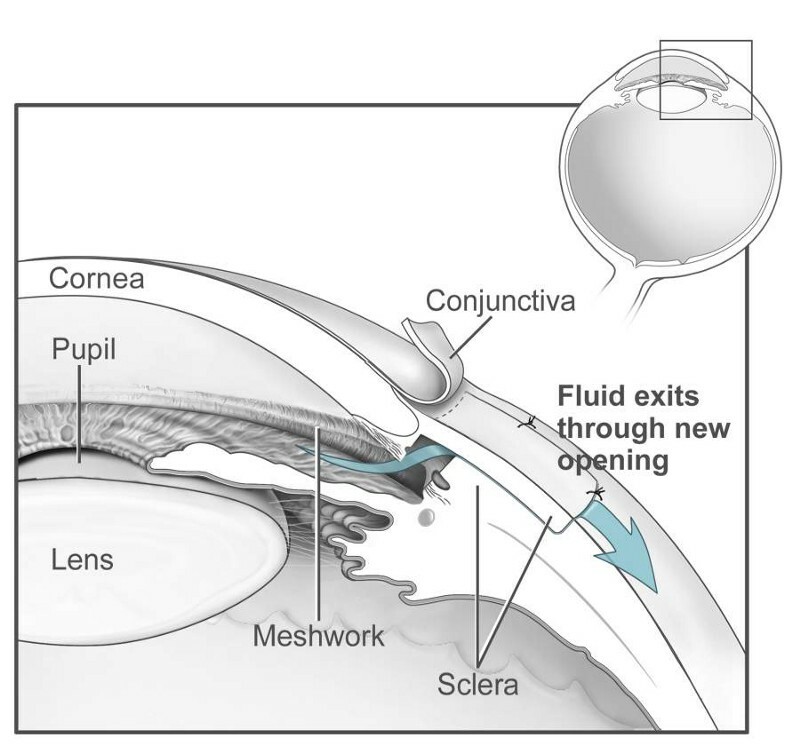 Diagram of How the Fluids in your Eye Exit. Narrow angle glaucoma occurs when your iris is closer to the drainage angle than normal in the eye. This abnormality can cause the drainage angle to block which leads to the eye pressure rising very quickly. This is referred to as an acute attack, if not treated immediately; you can go blind. You should contact your ophthalmologist straight away if you start presenting symptoms. People with narrow-angle glaucoma have developed this slowly over time just like open-angle glaucoma. There are no symptoms at first; they only present themselves when there is severe damage or if the person is having an acute attack. The pressure of the eye can change hourly, daily or weekly. If your eye pressures are borderline or if the damage caused by glaucoma is progressing, it may be necessary to monitor your eye pressure over a whole day or half a day. This examination is very simple. You have to look at a blue dot while a harmless laser beam scans your eye. The OCT can pick up changes in the thickness of you retina and the nerve fibers that carry the vision to your optic nerve before the vision is affected. This allows ophthalmologist to diagnose and treat glaucoma far earlier than before. This is measured by a laser or ultrasound. The intraocular pressure may be underestimated when the cornea is thin and may be overestimated when the cornea is thicker than average. This test is done on a machine with sequential spots of white light of varying sizes and brightness shone onto a bowl into which you look into. The patient responds by pressing a button every time they see the light. This helps assess if you have glaucoma as it tests the areas of the field of vision which are attacked most frequently by glaucoma. The first signs of damage are usually the development of areas where the light has to be brighter before you can see it. These tests need to be carried out every six to twelve months to ensure that any signs of glaucoma are caught early, monitored and treated. Glaucoma can be treated with eye drops, laser surgery, traditional surgery or a combination of these methods. The goal of any treatment is to prevent loss of vision, as vision loss from glaucoma is irreversible. When deciding on a treatment it is important to understand what actions you need to take, how regularly you need to take your eye drops etc to ensure that you glaucoma is stabilised and does not deteriorate.